Njut av en Marina Front Sapphire Village Studio Condo med balkong med utsikt över vackra Sapphire Beach turkos vatten. Bara fotspår bort från pool, restaurang och bar. Oändliga aktiviteter inklusive jet ski uthyrning, kajakuthyrning, djuphavsfiske, segelbåt charter och mycket mer. Kort promenad runt marinan till vackra Sapphire Beach. 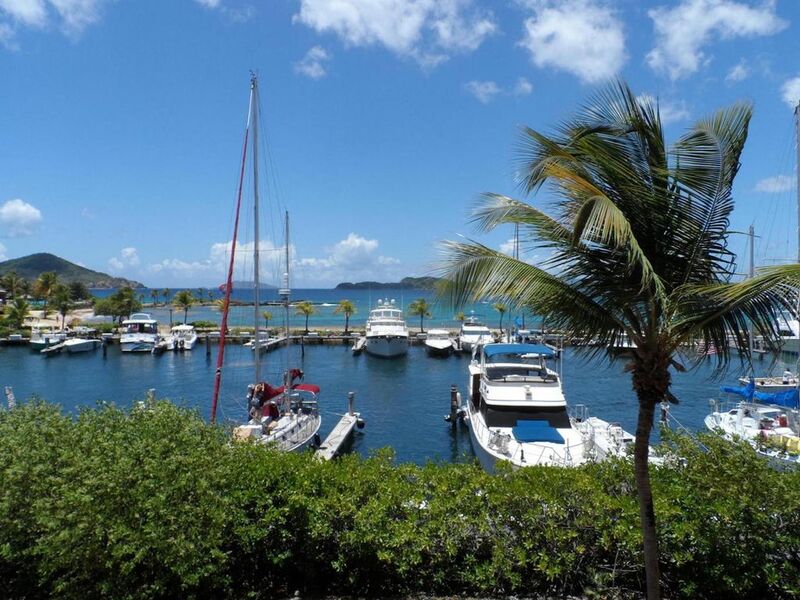 Var noga med att besöka trendiga Red Hook, mindre än fem minuter, där du hittar färjan till St. John & BVI, restauranger, shopping och gott om nattliv. Eller bara koppla av och ta i ljudet av havet och känna den sanna karibiska brisen. The condo är mysigt välutrustade. Kök och matplats inkluderar: Bord och stolar, kylskåp, spis / ugn, mikrovågsugn, kaffebryggare, mixer, brödrost, köksredskap, gott diskar och köksredskap. Underhållning inkluderar: plattskärms-TV. Gratis privat Wi-Fi. DVD-spelare (DVD-skivor kan checkas ut på kontoret, utan kostnad). Väckarklocka. Mp3-spelare. Beach bekvämligheter inkluderar: snorkel utrustning, strandhanddukar, små kylare, stranden väskor, sport stolar, volleyboll, solskyddsmedel och sol lotion. För extra bekvämlighet gör vi också vårt bästa för att förse våra gäster med de viktigaste som toalettpapper, pappershanddukar, schampo, kroppsvätska, tandpasta, insprutning etc. Sapphire Village har 2 pooler, solstolar, paraplyer i tiki-stil, restaurang på plats, tvättstuga, gratis parkering, DVD och bokuthyrning tillgänglig för alla gäster. >> Var noga med att kolla in vår andra fastighet med bra recensioner på samma plats och samma byggnad! We had an amazing stay! Very clean accommodations, (thank you Terrance and Stacy) with amazing views, close to pools, beach and restaurants. Easy access to Red Hook and local shopping areas! Took ferry to St. Johns for the day and enjoyed the beautiful beaches and went back at night to enjoy the restaurants. Great experience booking with Terrance! Clean, well decorated condo with supply of amenities. Beautiful ocean view. Would book again if I stay in Sapphire again. My husband and I thoroughly enjoyed the location and convenience of the condo. From the awesome harbor view, to the pool just steps away, to the clean and comfortable condo, everything about our stay was wonderful. We will be back! We had an awesome stay. There is excellent food at the on site restaurant and the beach is only a few minutes away. There is some excellent snorkeling on saphire beach. Snorkel gear is provided. Terrence and Stacy helped us out tremendously with ideas of what to do. The ferry to St. John is only a couple miles away. We highly recommend staying at this location. Unit was still being cleaned when we arrived early. Once inside it was exactly what we needed. It was clean, well appointed and comfy. Went to slice which was enjoyable and walked over to sapphire bay. Easy access to red hook using $1 bus. Terrance and Stacy had great communication beforehand. I would absolutely stay in this unit again. Clean ,well equipped, just bring your groceries and enjoy the view and amenities ... home away from home!